Some time ago I was searching a touch display for a project of mine. The requirements were 7 inch in size, capacitive touch digitizer and at least a resolution of 800x480px. I figured out Waveshare’s “7 inch HDMI LCD (B)” would be the perfect match. And I was thrilled that not only it was not only relatively cheap, but they got it right and (so the claim) implemented “fully valid” HID protocol (their shop still states “When work as a computer monitor, supports Windows 10/8.1/8/7, five-points touch, and driver free”). After a few days of discussion Microsoft acknowledged that there was some change in the HID report processing pipeline, which now discards HID reports that are malformed. The advice was to contact Waveshare to see what they could do about the issue. Long story short, I never got a satisfying answer. So I decided to fix it on my own. In the picture above you see the touch display’s PCB (with a STLink v2 clone attached). 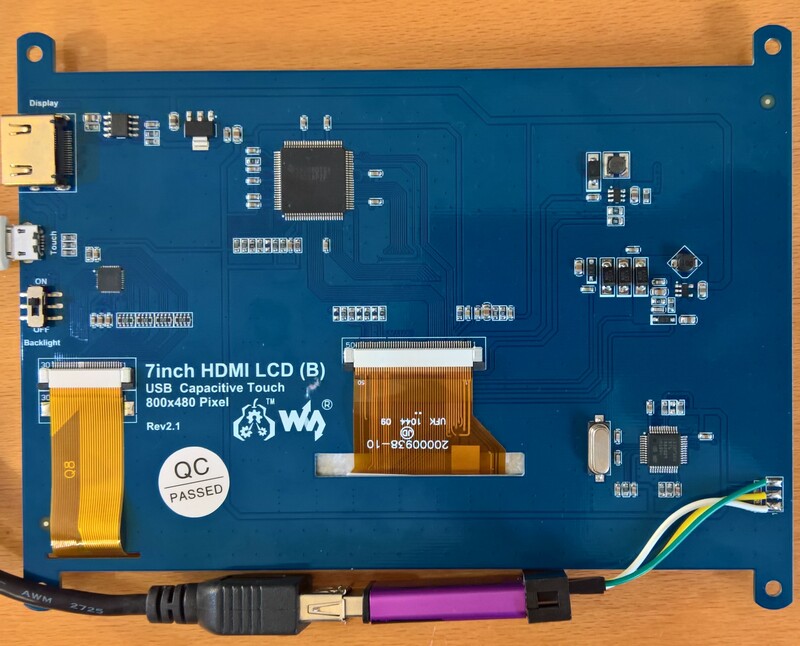 The big chip in the upper half is a Texas Instrument TFP401APZP LCD driver, which, while being an interesting piece of hardware, isn’t relevant to this post. On the left side, mid-PCB, you can see a 40 pin QFN package which turned out to be a touch screen digitizer chip made by Goodix, more specifically a GT811. Whilst I was unable to find a datasheet in a language I understand, I found a Chinese copy that I could Google-Translate in parts. It wasn’t fun, but enough to understand it’s connected via I2C to the micro-controller and to get a register map of the chip. Last but not least there’s a GD32F103 dubbed chip in the right bottom corner of the board, which turned out to be a pin and (mostly) register-compatible replacement for ST’s STM32F103 Cortex M3 micro-controller. Basically the mode of operation of a touch display controller is pretty simple; step one is reading data from the touch digitizer and then sending it to the host device in a legible format. So far so easy. Well, mostly ;) There are a few hoops to get through! Whilst I already had the joy to implement USB devices on micro-controllers (mass storage devices, DACs, serial devices), the HID class of devices was a prime-time for me (if ignoring the SDK examples you get to look at with each new dev-kit). Where should I start? Let’s say that there are numerous other protocols on earth that are easier to understand but I got my way around it within a day and a half. Basically the USB HID specification states that a device should send a “report descriptor” which contains information of HOW the data which will be will sent later looks like. The meaning of it all is to describe the meaning of each transmitted byte to the host (your computer) for it to be able to route the HID requests properly. Remember the time where there were loads and loads of Windows laptops with crappy touch pads and weird touch screens? Well it’s mostly gone now thanks to Microsoft having put a lot of effort into raising the bar for input devices certification (for vendors to get that shiny “Windows certified” logo). One of the steps involved was a uniform specification for the Human Interface Devices class of products. Basically Microsoft wrote a nice and tight specification with clear requirements of the data that a pointer device has to report. While the translated bits of the data sheet were helpful to evaluate if starting this project was going to be worth it, I couldn’t help myself but digging trough Github repositories until I found some driver dubbed “GT811” in a handful of Linux kernel repositories (mostly for some cheapo tablet computers). Those were a tremendous help, mostly for getting the touch screen configuration right. I already worked with STM32 series chips and made good experience with using the libopencm3 instead of ST’s driver packages (where you have the choice of either the old and crufty “Peripheral Library” or the big and clunky “CubeMX HAL”). I even found a GD32 port published on Github that already implemented the few differences to the STM32F1xx serie (mostly clock setup related). Report 1: A valid (TIP = 1) contact point (ID = 0) at (X:255 / Y:104) with “pressure” 48 and two valid contacts in this frame. Report 2: A valid (TIP = 1) contact point (ID = 1) at (X:540 / Y:35) with “pressure” 34. And this first implementation was almost perfect. Maybe a little too simple however. The issue (as I was kindly pointed at by the IoT Core team) was that the HID stack expects a “touch up” report to be sent when the user lifts his finger from the touch display. Implementing that basically means remembering the last coordinates sent for each “finger” and sending a “touch up report” with the same coordinates but the TIP state set to 0. This is expected to happen on the report frame following the change in state, otherwise the finger is stuck “down” which create funny issues like scrolling moves creating “jumps” and more. An interesting detail is that the HID stack seems to use the scan time information in the reports to calculate inertia for “natural movements” when scrolling. Getting all of that goodness on your screen? The good news; you can. The bad; there’s a bit of work involved. The first prerequisite is getting your hands on a STM32 compatible SWD probe. Cheap options are salvaging one of ST’s STM32Fxxx development kits or buying one of those cheap ST-Link v2 clones (I got a bunch of those shipped in random coloured aluminium cases, at less than 5 USD a piece). Connecting the probe involves a bit of soldering, as there are no pin headers on the board. I ended up soldering DuPont wires directly on to the contact points. NOTE: You can most certainly compile the project just fine on Windows too, I just didn’t try. YMMV. Once you got the firmware built, you have to flash it to the screen. This is the point of no return in the whole procedure as we’re replacing the original firmware here. There’s one tiny pitfall here; the flashing process may fail (depending on the type of probe and the flashing software your using) if you don’t reset the “readout protection bit” of the GD32 first. Also note that doing so is erasing the flash memory. For all those not too afraid of all this, go on; a step by step guide is in the README file in the repo. Good luck, and have fun with the new and hopefully better touch screen firmware ;) I’d love to hear some feedback from you guys. Contributions or bug reports are most welcome too!